Qualcomm is probably the most popular mobile System-on-chip maker amongst the smartphone manufacturers. They make everything simple and easy and today Qualcomm has deployed a new naming scheme to their mobile processors. They've changed from their conventional S1, S2, S3 and S4 line-up, opting instead for Snapdragon 200 through to 800 in intervals of 200s. The only logical reason we can think of for this is to avoid confusing with Samsung Galaxy S line of smartphones which may happen with the average consumer! So what's actually changed here? Well a surprisingly large amount actually, this is quite a big refresh for the processor line! Lets start with the best, the 800. This chip is built on TSMC’s new 28 nanometer process called HPm. This is effectively a more efficient process than the one used to create the current S4 and S4 Pro. The shiny new 800 has four Krait 400 processors that can be clocked at all speeds up to 2.3 GHz and these will come with a new GPU called the Adreno 330, which promises speeds that are twice as fast as the last Adreno 320. On the memory transfer front the new 800 MHz LPDDR3 RAM can deliver speeds of up to 12.8 gigabits per second. Connectivity options got a boost too with 150Mbps LTE being supported as is 802.11ac support, which can transfer data at a maximum of 1 gigabit per second. All in all Qualcomm thinks this chipset can g0 75% faster than today’s S4 Pro, which is a great improvement over an already stellar processor! The 600 is probably most equivalent to the current S4 Pro, but it'll feature a faster memory interface, better GPU, and the Krait architecture will be manipulated to squeeze more performance out of similar clock speeds! The whole rig should be 40% faster than the S4 pro and it can be clocked at all speeds up to 1.9Ghz! 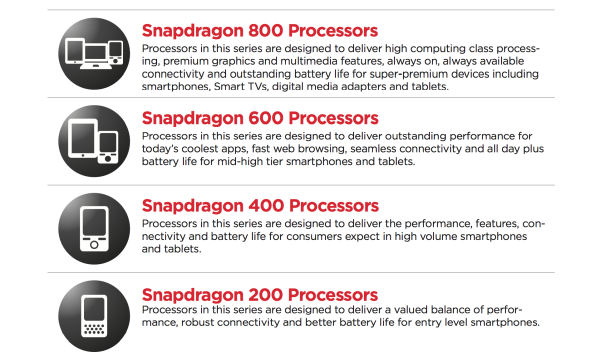 The Snapdragon 400 and 200 are basically refreshes of Qualcomm's older ranges like the S3 and S2 in much the same way the 600 and 800 equalled and build on the S4 Pro! We're sure that they'll pop up in a lot of Chinese made phones which don't make it to the West! 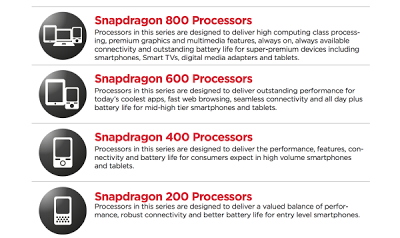 The little images in the picture at the top give you a good indication of the uses Qualcomm expects to see from each of their processors! So what do you think of these new chips? Which one do you want in your next phone? Let us know in the comments below!